A familiar sight in Australia, the Australian king parrot is a somewhat rare pet in the United States and other parts of the world. They make relatively calm and quiet pets if hand-raised, however, and their striking colors make them ideal for a bird enthusiast looking for an unusual specimen. The Australian king parrot has a number of other common names, including green-winged king parrot, eastern king parrot, Queensland king parrot, king lorie and scarlet parrot. The taxonomical name for the Australian king parrot is Alisterus scapularis. The species was first described by German naturalist Martin Lichtenstein in 1818. The genus Alisterus includes three species, all of which are known as king parrots. 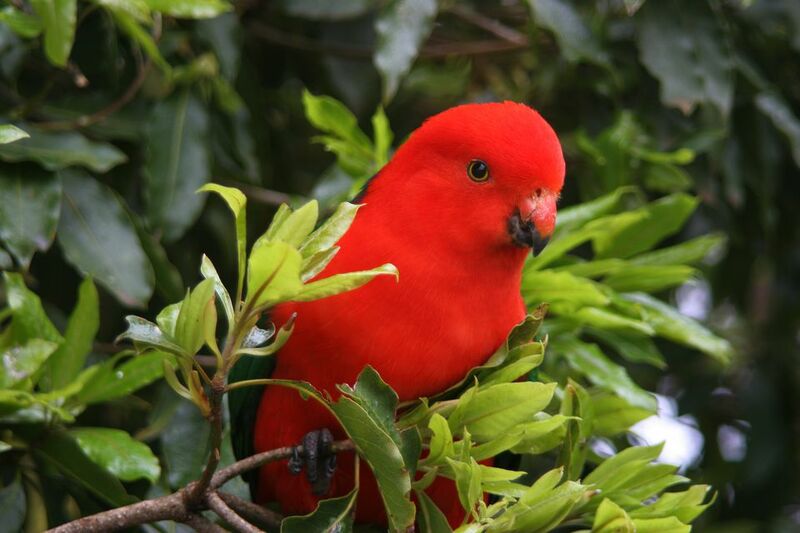 The other species include the Papuan king parrot and the Moluccan king parrot. There are two recognized subspecies of the Australian king parrot: Alisterus scaplaris minor, and A.scapcularis scapularis. Australia king parrots are native to coastal eastern Australia and New Guinea, where they are a common sight in parks, farmlands, and suburbs. Australian king parrots are rather large birds, averaging between 16 and 18 inches in length from the beak to the tips of the tail feathers. In captivity, Australian king parrots live an average of 25 to 30 years with proper care. Australian king parrots are not overly affectionate birds, and most tend to prefer not to be handled. While there is the occasional exception, it is rare for a king parrot—even one that was hand-fed as a baby—to bond as strongly with their owners in the same way that cockatoos and some other parrot species do. This is not to say that these birds are anti-social—to the contrary, many Australian king parrots do enjoy interacting with their owners and even learn to say a few words. But if you are looking for a cuddly parrot, then this is not the best species for you. Although these are large parrots, Australian king parrots are known to be among the more quiet parrot species and they tend to not scream in the same manner as the other large hookbills such as macaws. Instead, they tend to pleasantly vocalize at an audible but very agreeable level and will entertain their owners with their whistles and chatter. When properly socialized and motivated, Australian king parrots can learn to talk, but they are not especially noted for remarkable speaking ability. Australian king parrots are a dimorphic bird species—and dramatically so. Males have bright red plumage on their heads and chests, vivid green feathers on their backs and tails, and blue feathers underneath their wings. they are the only parrot with entirely red heads. Females of the species have green feathers on their heads, backs, and chests, red on their bellies, and a patch of blue on their rumps. Both sexes have dark gray skin on their feet and legs. While highly sought after due to their quiet nature and beautiful colors, it can be hard to find an Australian king parrot. If you are looking to adopt one as a pet, try contacting your local exotic bird club or aviculture society and ask about breeders in your area. Once you are in contact with breeders, ask plenty of questions and try to make an appointment to visit with them and their birds. It is important to understand exactly what it is like to live with an Australian king parrot before bringing one home. Although the vast majority of Australian king parrots prefer minimal handling, they can be hand-tamed by patient owners and are reported to be among the most gentle large parrots in the world. This is not to say that an Australian king parrot will never bite—because all parrots will bite. However, these birds generally prefer more peaceful methods of interacting with their human caretakers. The Australian king parrot is a very acrobatic bird that requires a large cage or aviary. An ideal environment is an enclosure 3 to 6 feet wide and 12 to 15 feet long. If kept in a smaller enclosure, this bird will require a lot of out-of-cage exercise each day. In the wild, Australian king parrots feast on a diet of fruits, nuts, berries, seeds, and flowers. In captivity, as with all pet birds, proper nutrition is essential to a king parrot's health. Most owners offer their birds a high-quality commercial pellet and seed mix, supplemented with plenty of fresh fruits and vegetables such as corn, carrots, mango, bananas, and leafy greens like spinach. Although high in fat, nut treats such as almonds and peanuts are a favorite of these birds. Whole grains like oats, millet, and quinoa are also readily accepted at feeding time. Australian king parrots, being large birds, need plenty of room to exercise. These birds love to climb, swing, and chew, so a very large cage with plenty of safe toys is the optimum environment for them. Although they generally don't crave human interaction as much as some other parrot species, they still require a minimum of 3 to 4 hours of supervised out-of-cage playtime per day. This should take place in a large "bird-proof" area of your home, as Australian king parrots are very curious and intelligent and can get themselves into trouble if precautions aren't taken to ensure their safety. Australian king parrots are very susceptible to Bacillus infection, which is nearly always fatal, and difficult or impossible to treat. Make sure to purchase a bird that has been adequately quarantined. If kept in a traditional outdoor aviary with earthen floors, Australian king parrots can be prone to intestinal worms, which will require attention from a veterinarian. This is rarely a problem with aviaries or cages raised above the ground.